The number two seed Hopkinton Hillers and the 15 seed Dover Sherborn Raiders met March 3 at Pirelli Veterans Memorial Rink in the first round of the Division 3 South Massachusetts State Hockey Tournament. During the regular season, these two TVL contenders met twice, and both times the Hillers defeated the Raiders. However, according to assistant coach Scott O’Connor, the Hillers had no intention of taking the Raiders lightly. “I don’t care if we’re playing the one seed or the fifteen seed. 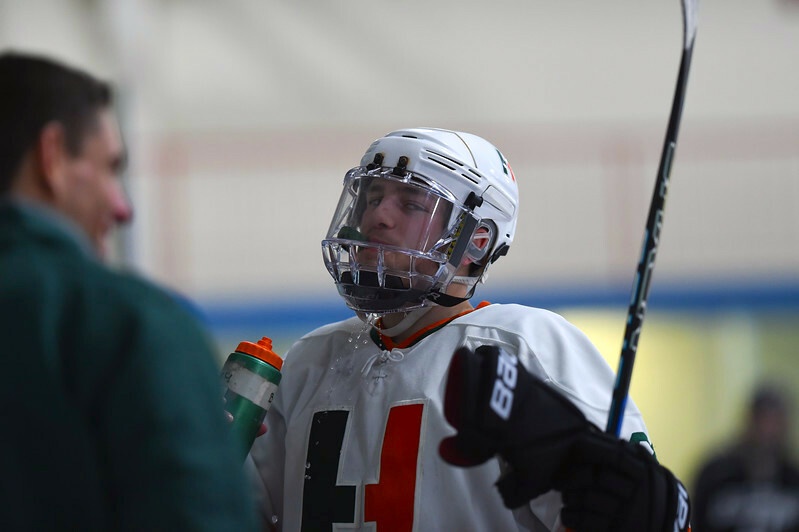 If we want to win a state championship this year, we need to play with the same intensity and hunger every time we step on the ice,” O’Connor said. The Hillers were the clear favorite going into Saturday boasting a 17-2-1 regular season record over the Raider’s 10-8-2 record. 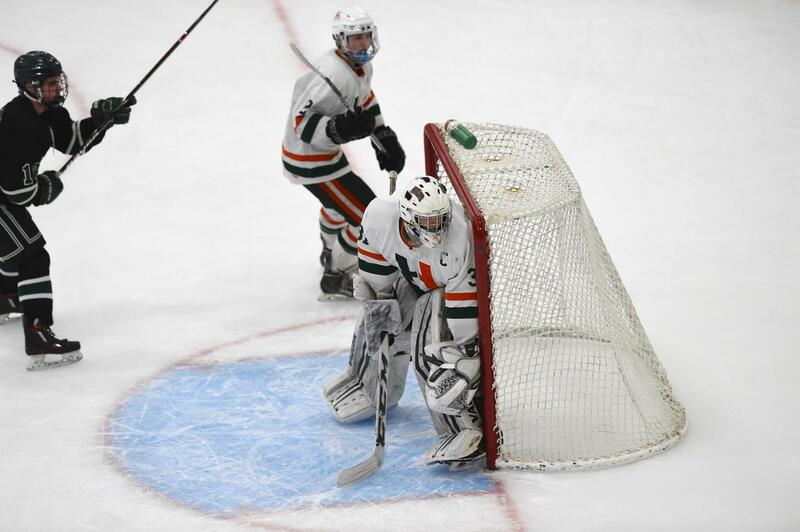 In addition, only adding to the Hiller’s confidence, was the return of previously injured senior captain Owen Delaney. Earlier in the season, Delaney suffered from a fractured collarbone and missed nearly six weeks of regular season play. However, now fully recovered, he could not wait to get back on the ice and make his first debut a memorable one. “I’ve never been more excited to play in my life. Obviously, missing so much of my senior season was tough. However, the opportunity to make my return just in time for playoffs is a blessing and something I plan to take full advantage of,” Delaney said. Also very important, senior captain Will Abbott hoped to surmount the Hopkinton High School hockey record for most points of all time. The record was 145 career points, and Abbott trailed it by just two. “I think that having the most points in school history would be a great way to finish off such a successful season and an even better way to finish off my high school career,” Abbott said. For both Delany and Abbott, the matchup with DS was more than just another playoff. As seniors, they both realized that every game from there on out could quite possibly be their last, and, as a result, both of them wanted to make sure that they left everything on the ice. “We have been working hard all year long to get to this point, and we don’t plan to stop this Saturday. In fact, we don’t plan to stop until every single one of us is in the Garden holding that trophy above our heads,” Abbott said. 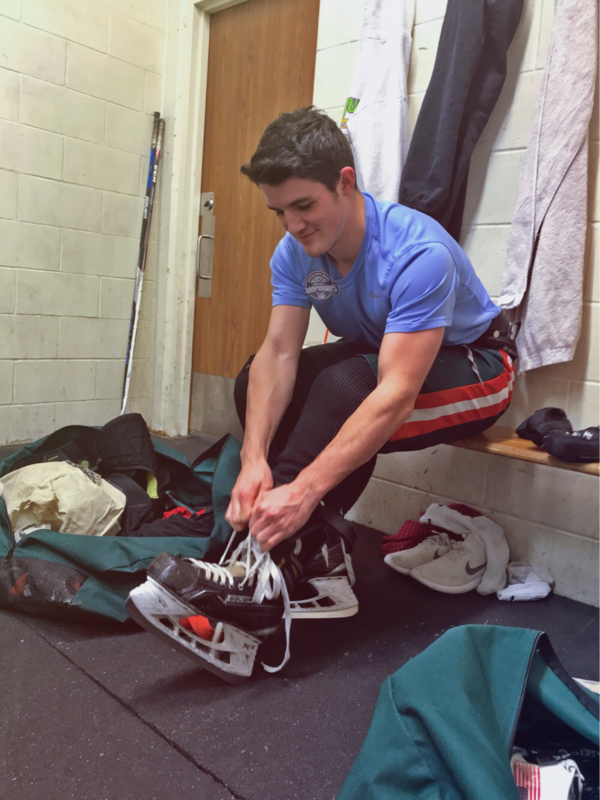 Owen Delaney lacing up his skates before practice. Photo by Hunter Temple. The Hopkinton Hillers dominated the Dover Sherborn Raiders by a final score of 7-1. The Hillers started with an early goal in the first minute, scored by Owen Delaney. It was a dream start for the Hiller’s senior captain, in his first game back since suffering from a fractured collarbone. The Raiders responded with a goal from senior defenseman Max Arnone with 5:39 left in the first period. Owen Delaney then continued his success in the final minutes of the first with his second goal of the game assisted by sophomore left wing Sean Walsh. “DS is a hard-working team, but our depth and speed allowed us to wear them down after the first period. Although the first fifteen minutes was a close battle, DS simply could not compete as the game wore on,” Delaney said. In the second period, the Hillers wore down the Raiders, eventually adding a late period goal from senior captain Will Abbott to make the score 3-1. According to assistant coach Scott O’Connor, Dover Sherborn was noticeably winded as the second period wore on. “During the second is when I really started to notice a shift, they [Dover Sherborn] just couldn’t keep up. Their starters barely ever got off the ice, and trying to win a game running one exhausted line against three well-conditioned lines is virtually impossible,” O’Connor said. The Hillers immediately took control in the third period. The shot totals in the third period alone (19-3), allowed the Hillers to overwhelm freshman DS goaltender Aidan Britt. The Hillers managed to net four goals in the third with Will Abbott, DJ Sloan, Andrew Gilbert, and Kyle Rogers each having one apiece. Will Abbott also managed to overcome the Hopkinton High School record for most points of all time with an assist on the 4th goal from DJ Sloan. March 5, the Hillers moved on to the South quarterfinals to face off against the Dartmouth Indians at Gallo Arena in Bourne. O’Leary guarding the left post. Photo by John Copley. 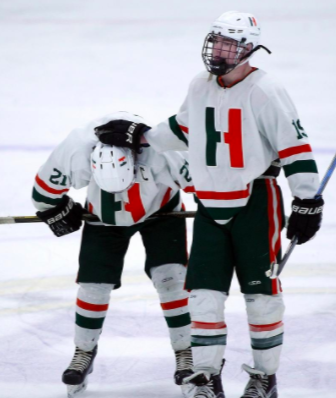 The second-seeded Hopkinton Hillers looked to extend their playoff dreams on March 5 against the 10 seed Dartmouth Indians. Despite the fact that this postseason contest was the first time the Hillers faced the Indians, senior captain Connor Delaney was very confident in the Hiller’s ability. “With Owen finally back from his injury, we can run three forward lines pretty consistently which is a luxury that Dartmouth doesn’t have. If we play with speed and physicality, I think it’s going to be very difficult for Dartmouth to keep up with our pace for three full periods,” Delaney said. Despite the confidence of senior captain Connor Delaney, assistant coach Scott O’Connor wanted to make sure he did his research on the Indians and decided to scout their first tournament game against Holliston. “Being able to familiarize yourself with your opponent is definitely vital in a single elimination tournament like this one. For example, number 9 on Dartmouth’s first line loved to rush the puck. And although he was small, he was shifty and could open up the ice if you didn’t play the body on him. Knowing this sort of information in advance and being able to prepare for it and then counter it can oftentimes be the difference maker in these sorts of matchups,” O’Connor said. According to senior captain Dylan O’Leary, every player on the team was taking this scouting report as well as this game very seriously because it served as an opportunity for the Hillers to prove a point that they have been waiting to make for nearly a year. “Last year, despite having the best record in school history, we lost in the third round of the tournament and all of us were devastated. This year, we’re in the exact same position with the exact same record, so Monday means a lot to us. It’s our chance to redeem ourselves and prove that we have what it takes to win a State title for the first time in school history,” O’Leary said. An explosive third period allowed the second-seeded Hopkinton Hillers to defeated the 10th seeded Dartmouth Indians 7-2. The first period started off quick with a first-minute goal from Hiller’s sophomore Sean Walsh. Dartmouth’s Bryce Souza fired back with a goal of his own only six minutes later tying the game up at one. Owen Delaney, coming off of an impressive two-goal performance against Dover Sherborn, came alive once again in the final two minutes of the first to put the Hillers back into the lead. The second period was even closer than the first, with each team only managing a goal a-piece. In the third period, the Hillers broke the game wide open scoring four goals in fifteen minutes to make the final score 7-2. Senior captain Will Abbott, freshman Andrew Gilbert, senior DJ Sloan, and junior Stephen Simoes all scored in the final period to award the Hillers with yet another commanding victory. “We knew going in that we needed to play a full 45-minute effort if we wanted to move on, and that’s exactly what we did. Dartmouth only showed up to play for two periods, and, as you can see by the scoreline in the third period, we took full advantage of that,” Simoes said. The Hillers will move onto play the No.3 seeded Rockland Bulldogs at 8:00 PM on Friday at Gallo arena for the Sectional Semi-finals. The two seeded Hopkinton Hillers faced off against the three seeded Rockland Bulldogs March 9 for the Massachusetts South Sectional Semifinals. The Bulldogs, coming off of a convincing 5-0 victory over the 11 seeded Greater New Bedford Bears, hoped to continue their post-season success against the Hillers. The Hillers dominated the 10 seeded Dartmouth Indians on March 5 by a scoreline of 7-2, and, according to Head Coach Chris MacPherson, they did not plan to stop on Friday. “Rockland is nothing that we haven’t seen before… we’re going into Friday with the same mindset we have had all year long: Finish the Marathon. ‘Finish the Marathon’ has been our mantra since day one. We got through mile 22 last week when we beat Dartmouth and mile 23 will be no different,” MacPherson said. The Bulldog’s senior captain, Mike Flaherty, had been a weapon on the ice for Rockland all season with a staggering 57 total points in 21 games. Fortunately, the Hillers did their homework on Flaherty and were confident in their ability to shut him down on the ice. “Obviously he’s [Flaherty] a skilled player, but we have seen all his film and we know how he plays. The key to shutting him down is going to be simple: keep him to the outside and watch his chest. He’s got good hands, but as long as we play the body and don’t let him get any quality looks on Dylan, we’ll be fine,” said senior captain Owen Delaney. The Hopkinton Hillers coasted through the first two rounds of the Division 3 South State tournament, clobbering the Dover-Sherborn Raiders and then the Dartmouth Indians by a combined margin of nine goals. However, in the sectional semifinals at Gallo Arena the Hillers faced a much tougher opponent in the No.3 seeded Rockland Bulldogs. The beginning of the first period was all Hopkinton as DJ Sloan and Tommy Hamblet managed to combine for two goals in the first six minutes of the game. However, within the next 1:14, the Bulldogs were able to quickly respond with two goals of their own from Joseph Yeadon and Dan McHugh. “It really feels like we just gave away the lead. I think we got comfortable and just took our foot off the gas. Unfortunately, against a team like Rockland that kind of complacency was bound to come back and bite us, and it did,” senior captain Will Abbott said. The Hillers came out hungry in the second period with a five-hole goal from senior Matt Lindquist just two minutes into the period. The Bulldogs slowly began to wear down Hopkinton with their physicality and eventually managed to tie the game up at three with a goal from Zach Callahan. With just 3:26 left in the second, Owen Delaney was boarded for a 5-minute major on the Bulldogs. However, despite the Hiller’s man advantaged, Joe Campanile forced a turnover at the Bulldog’s blueline and went down the ice to a roof a breakaway goal to give Rockland a 4-3 lead. The third period was dominated by Hopkinton with a shot count of 11-6 in favor of the Hiller’s. Unfortunately, the Hillers were simply not able to capitalize on any of their opportunities with Harry O’Brien standing on his head in order to lead the Bulldogs to their eventual 4-3 victory. “It’s definitely tough to end such an amazing season in such a sour way, but I really couldn’t be prouder of these boys. They are such an incredible group of young men and it has been an honor coaching them this year,” said head coach Chris MacPherson. A terrific season for the TVL Champions came to an end with the Hiller’s managing a 19-3-1 record. Meanwhile, the Rockland Bulldogs moved onto face Hanover for the Division 3 South State title.